This is just an external version of internal SATA 1, 3, or 6 connections (see table at top of page). Internal SATA ports are right on the motherboard, eSATA ports are usually on the back of the computer near the USB ports. eSATA ports are red in color and depending on your motherboard capability they could be either 3000 or 6000 Mbps in speed. SATA Express, (SATAe) initially standardized in the SATA 3.2 specification, is an interface that supports either SATA or PCI Express storage devices. The host [SATA Express Connector Port] connector is backward compatible with the standard 3.5-inch SATA data connector, allowing one or two legacy SATA devices to be connected to the host plug. At the same time, host connector provides multiple PCI Express lanes as a pure PCI Express connection to the storage device. Connectors used for SATA Express were selected specifically to ensure backward compatibility with legacy SATA devices where possible, without the need for additional adapters or converters. The connector on the host side accepts either one PCI Express SSD or up to two legacy SATA devices, by providing either PCI Express lanes or SATA 3.0 ports depending on the type of connected storage device. Max recommended cable length, 3ft. Using two PCI Express 2.0 lanes provides a total bandwidth of 1 GB/s, equating to effective 1000 MB/s), while using two PCI Express 3.0 lanes provides close to 2 GB/s, equating to effective 1969 MB/s. Formerly known as the Next Generation Form Factor (NGFF), M.2 is a specification for internally mounted computer expansion cards and associated connectors. It replaces the mSATA standard (phasing out), which uses the PCI Express Mini Card physical card layout and connectors. M.2’s more flexible physical specification allows different module widths and lengths. Paired with the availability of more advanced interfacing features, M.2 is more suitable than mSATA for solid-state storage applications in general and particularly for the use in small devices such as ultrabooks or tablets. Buses exposed through the M.2 connector are PCI Express 3.0, Serial ATA (SATA) 3.0 and USB 3.0, which is backward compatible with USB 2.0. The M.2 specification provides up to four PCI Express lanes and one logical SATA 3.0 (6 Gbit/s) port, and exposes them through the same connector so both PCI Express and SATA storage devices may exist in form of M.2 modules. The speed would be the same as SATA 3/6 so that does not change. Only a more streamlined, future ready style connection geared for tablets, laptops and more. (mSATA on left, M.2 SATA on right). M.2 module provides a 75-position edge connector; depending on the type of module, certain pin positions are removed to present one or more keying notches. Host-side M.2 connectors (sockets) may populate one or more mating key positions, determining the type of modules accepted by the host; as of April 2014, host-side connectors are available with only one mating key position populated (either B or M) and they are not interchangeable. M.2 sockets keyed for SATA or two PCI Express lanes (PCIe ×2) are referred to as “socket 2 configuration” or “socket 2”, while the sockets keyed for four PCI Express lanes (PCIe ×4) are referred to as “socket 3 configuration” or “socket 3“. 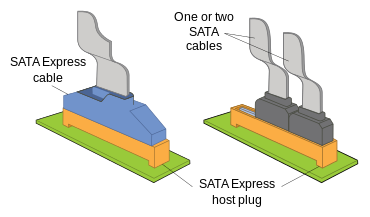 M.2 modules with two notches in B & M positions use up to two PCI Express lanes but provide broader compatibility, while the M.2 modules with only one notch in the M position use up to four PCI Express lanes; both examples may also provide SATA storage devices. B + M = SATA, PCIe x2. Will fit either B or M above. That said, if you plan to add or change to an M.2 SSD in your laptop, make sure you do your research and know what you need before buying. For example, look at the detailed specs on your motherboard and be certain of the types of SSD slots that you have. An M.2 PCIemodule will NOT fit into an M.2 SATA port, and vice versa. As mentioned, depending on the host motherboard the M.2 socket can support PCIe, SATA and sometimes both. You could have an M.2 in B, M or B+ M key form factors, as well as PCIe or SATA. The M.2 that you use should match the type of M.2 socket that your motherboard supports. If you attempt to install an M.2 SATA SSD into an M.2 PCIe ONLY slot, it will not work. Similarly, if you attempt to install an M.2 PCIe into an M.2 SATA ONLY slot, it will not work. Add in cards like the one shown here allows you to convert a SATA only M.2 into a PCIe M.2. This will assume the speed of the much faster PCIe bus. The card shown would fit into the PCIe x4, x8 or x16 slot on your motherboard. Or if your motherboard does not have an M.2 slot, you could install a PCIe M.2 into a card like this, and install into a PCIe x4 slot for example. Cloning to or from an M.2 Sata board can be a little tricky. If you wish to clone an M.2 board to a regular SSD drive for example you will need cloning software like Acronis. 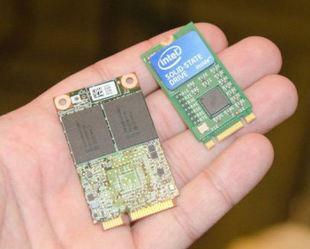 You cannot simply clone an M.2 or mSATA chip directly without the use of an M.2/mSATA to regular SATA adapter like the one shown left or the Kingston HyperX add-in card above. Just pop your M.2 chip into the adapter, then connect the it to a SATA cable on your cloning computer and clone as usual. There are also PCI express add in cards for desktops that will convert M.2 form factor. More on cloning in the FAQ section below. As the M.2 standard requires the SSDs (or, other types: WiFi, Bluetooth etc) only have chips on the upward facing side, this means that greater capacity drives are usually longer since they require more storage (NAND) chips. Generally there are up to five lengths of M.2, however not every motherboard or notebook can accommodate them all.​ 2230, 2242, 2260, 2280, 22110. Non-volatile memory express, also known as NVMe or NVM Express, is a specification that allows a solid-state drive (SSD) to make effective use of a high-speed PCI Express (PCIe) bus in a computer. nVMe is a new communications protocol that allows for faster data transfers than before, especially with high end SSDs. It is actually a replacement to AHCI protocol which had been a replacement to the IDE protocol. It is not a physical connection type. ​NVMe operates at the host controller and defines a command set and feature set for PCIe-based SSDs with the goals of increased and efficient performance and interoperability on a broad range of enterprise and client systems. An NVMe connection allows a solid state drive to have its data read straight from a PCI-E slot on the motherboard. The drive draws power directly through the motherboard. More importantly, the NVMe drive will also draw data through the motherboard at a faster rate than SATA 3. Simply put, an NVMe can queue more data at once due to having access to more PCI-E lanes, vs an M.2 connected to a SATA port on the board. The main benefits of NVMe with PCIe-based SSDs are reduced latency, increased Input/Output operations per second (IOPS) and lower power consumption, in comparison to SAS-based or SATA-based SSDs, through the streamlining of the I/O stack. ​NVMe allows PCIe SSDs such as U.2, M.2 or PCI-Express SSDs to run at peak performance five times that of SATA with less power consumption. These two protocols are used to read and write data. One uses PCI-E (NVMe) and the other doesn’t (SATA). So if you are buying a new M.2 SSD, make sure it has NVMe on the label that is if your motherboard supports NVMe. It if does not you may want to consider upgrading your computer to a new one that supports new technology. Will you notice the difference? Although read/write speeds of an M.2 NVMe are much faster than an M.2 SATA, you may or may not notice a difference depending on what you are doing. For example, gaming and everyday multitasking you may not notice a difference. Heavy computations such as calculations, mathematical, algorithmic etc you would see the difference of using an M.2 NVMe due to the faster read/write speeds. This would also be the case for video and photo editing (since file sizes are typically larger), NVMe drives can offer much better results. SFF-8639 later renamed to U.2 is another 2.5″ SSD like a SATA Express SSD, except U.2 isn’t limited by two lanes (up 10Gb/s performance). U.2 utilizes the PCIe 3.0 X4 (denotes four lanes) interface just like M.2, the main difference is that the capacity for these ultra-high-performance SSDs is not bound by a small circuit board size (more space for more flash-memory chips), so you can get higher capacity SSDs. However as of 2017, M.2 drives are now available in 2TB so the size advantage is a moot point. As you can see below in the design of the outer casing, there is also better heat dissipation as they can get rather warm when running at incredible speeds. All the latest motherboards have U.2 ports, or add-in adapter cards like the Asus Hyper Kit that comes with the higher end boards. The connections on U.2 style SSD drives is different than regular SATA connections. Note in the picture below, the extra 6 pin connector in the middle. This style connection is for U.2 only. ​As mentioned the newer style motherboards have the U.2 type connection which requires a cable similar to this one shown. The small square end connects to the motherboards U.2 connection, the other end connects to the U.2 SSD hard drive. Connections: M.2 and U.2 are completely different connections and are not interchangeable. U.2 vs M.2 PCIe: They both x4 PCIe lanes instead of the standard x2 PCIe lanes like a SATA or SATA Express port. Drive Size: U.2 will support larger sizes, but today, there are M.2 drives that go up to 2TB so the amount of space each can support is becoming negligent. Speed: In terms of speed (read/write speeds), it will purely depend on the speed of the SSD drive itself. As you can have a U.2 be faster than a M.2 or an M.2 faster than a U.2 if the read/write speeds are higher and the IOPS are bigger. It will all come down to the individual drive itself when determining which one is faster, not the physical M.2 or U.2 connection. For example, the Samsung 960 Pro will be faster than the Samsung 960 EVO. The read/write speeds as well as the IOPS are higher on the 960 Pro. There aren’t a lot of boards out right now that support the U.2 connection, but depending on where the market goes, it seems like M.2 drives are a lot more popular now due to the bigger sizes. That may change in the future, but for now, if you look at how M.2 and U.2 work, they are the same. They both use x4 PCIe lanes to achieve higher speeds. Q. How can M.2 support both SATA and PCIe? A. The M.2 spec was designed to accommodate both a SATA and PCIe interface. 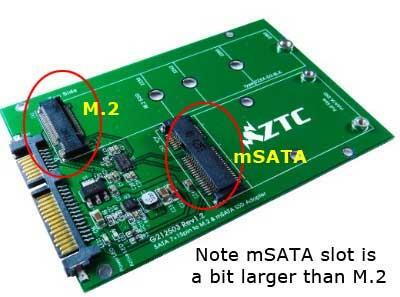 M.2 SATA SSDs will use the same controller currently on typical 2.5 in SATA SSDs. 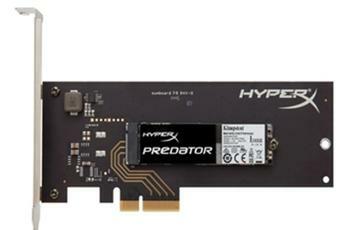 M.2 PCIe SSDs will use a controller specifically designed to support the PCIe protocol. ​Q. What is the difference between M.2 SATA and M.2 PCIe SSDs? A. M.2 is the physical form factor. SATA and PCIe refer to the storage interface, the primary difference is performance and protocol. 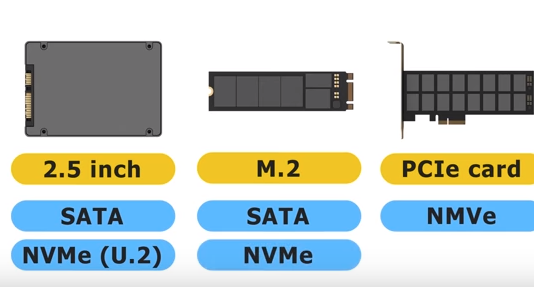 The M.2 spec was designed to accommodate both a SATA and PCIe interface for SSDs.M.2 SATA SSDs will use the same controller currently on typical 2.5 in SATA SSDs.M.2 PCIe SSDs will use a controller specifically designed to support the PCIe protocol. Q. Will an M.2 SATA SSD work if installed it inan M.2 PCIe SSD port or vice versa? ​A. No. If the host system doesn’t support the PCIe protocol, the PCIe M.2 SSD will most likely not been seen by the BIOS and therefore would be incompatible with the system. Similarly, with an SATA M.2 SSD installed into a socket supporting PCIe M.2 SSDs only, the SATA M.2 SSD would not be usable. Q. Does an M.2 SSD support both SATA and PCIe? ​A. No. An M.2 SSD will support either SATA or PCIe, but not both at the same time. In addition, system board sockets will be designated by manufacturers to support either SATA, PCIe, or in some cases, both. It is important to check your system’s manual to verify which technologies are supported; in some motherboards, there can even be sockets that support both and some limited to either SATA or PCIe only. Q. What types of systems support M.2 SSD drives? A. The motherboard in the system must support M.2 protocol. 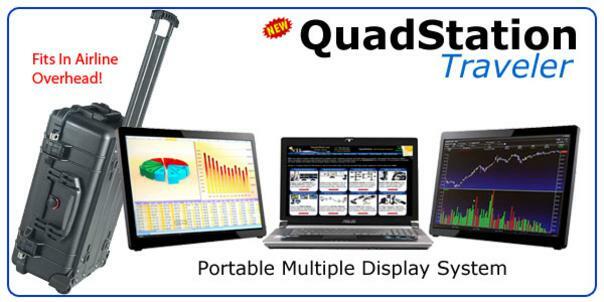 All NTI QuadStation computers support M.2 technology. Q. What do the different module keys on the M.2 drives mean? A. As mentioned above there are 3 commonly used key formats for M.2 SSD drives. B, M and B+M. ​An M.2 SSD with the B-key edge connector may support SATA and/or PCIe protocol depending on your device, but can only support up to x2 performance on the PCIe bus. 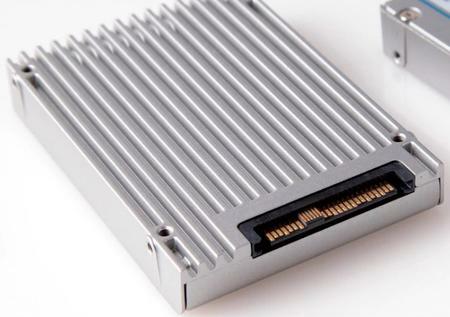 An M.2 SSD with the M-key edge connector may support SATA and/or PCIe protocol depending on your device, and can support up to x4 performance on the PCIe bus, provided that the host system also supports x4. Q. What is the benefit of having both B and M keys? A. The B+M keys on an M.2 SSD allow for cross-compatibility on various motherboards as long as the appropriate SSDs protocol is supported (SATA or PCIe). 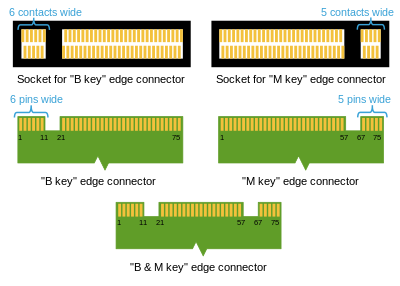 Some motherboard host connectors may be designed only to accommodate M-key SSDs, while others may only accommodate B-key SSD. The B+M keys SSD was designed to address this issue; however, plugging in an M.2 SSD into a socket will not guarantee it will work, as that will depend on having a shared protocol between the M.2 SSD and the motherboard. Q. Are M.2 PCIe SSDs faster than M.2 SATA SSDs? ​A. Yes. The PCIe interface is faster, as the SATA 3.0 spec is limited to ~600MB/s maximum speed, while PCIe Gen 2 x2 lanes is capable of up to 1000MB/s , PCIe Gen 2 x4 lanes is capable of up to 2000MB/s and PCIe Gen 3 x4 lanes with speeds of up to 4000MB/s. Q. Are M.2 SSDs faster than regular 2.5″ SSDs? A. No. Performance would likely be similar. it would also depend on the specific controller inside the host system that the SSDs were using as well as the internal layout and controller of each SSD. The SATA 3.0 specification supports up to 600MB/s whether in a 2.5-inch, mSATA or M.2 SSD form factors. Q. How to I Clone an M.2 SSD’s to another M.2 or to a regular 2.5″ SATA drive? We did not have consistent success attempting cloning directly to the M.2 with the OS loaded on it. The clone starts, but failed to rebooting during cloning process. Load the M.2 OS and all updates that you want to have on the cloned drive. Shut down and PULL the M.2 out of the main system, install into the HyperX add-in card. Move to another machine and install the addin card with the M.2 installed in it. This system should have its own boot drive, you are not using the M.2 to boot! Add the destination hard drive to that same cloning system and clone as usual with Acronis. When finished, shut the system down, and pull the drives. Test the cloned drive alone in the original system it should boot right to it. The next-generation M.2 PCIe SSDs will shift from utilizing the legacy AHCI drivers built into Operating Systems today to using a new architecture using a new Non-Volatile Memory Express (NVMe) host interface. NVMe was designed from the ground up to natively support NAND Flash-based (and possibly future non-volatile memory) SSDs and deliver even greater performance levels. Preliminary industry testing has indicated performance levels of 4–6 times greater than SATA Rev. 3.0 SSDs.